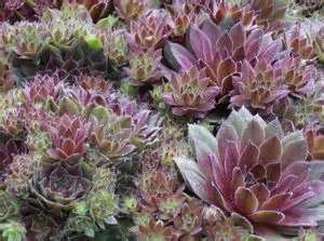 Arno Hen and Chicks is a low growing perennial that has medium-sized rosettes of ruby red inner leaves and outer green leaves. It will grow to a height of 4" to 8" tall and 6" to 12" wide. It will bloom from early summer to late summer shooting up flower spikes topped with light pink flowers. Plant Arno Hen and Chicks in full sun to partial sun in well drained soil. This is a plant that can take some neglect. It likes it hot and dry. Plant Arno Hen and Chicks in a Rock Garden, planted in crevices of rock walls, rooftop gardens and containers. It will become drought tolerant once it is established and is also deer resistant. Arno Hen and Chicks is also a Firewise Plant.